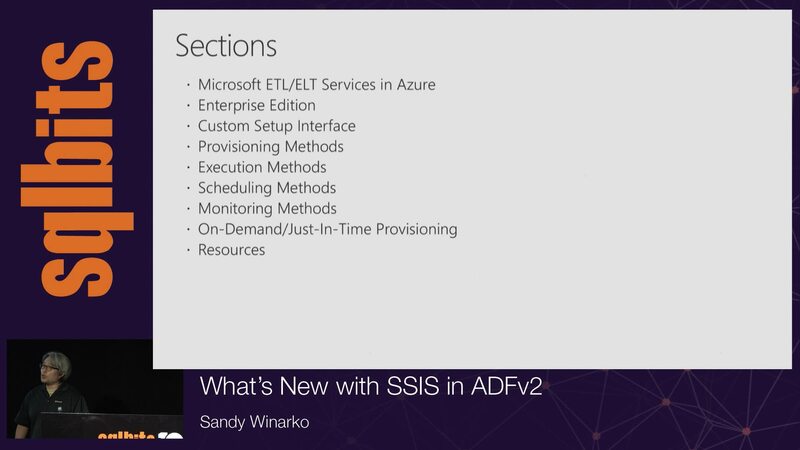 See the latest features of SSIS in ADFv2. We will show you how to join your Azure-SSIS Integration Runtime (IR) to an ARM VNet, so you can use Azure SQL Managed Instance to host your SSISDB and access data on premises. You will learn how to select Enterprise Edition for your IR, enabling you to use advanced/premium features, e.g. Oracle/Teradata/SAP BW connectors, CDC components, Fuzzy Grouping/Lookup transformations, etc. You will also learn how to customize your IR via a custom setup interface to modify system configurations/install additional components, e.g. (un)licensed 3rd party/Open Source extensions, assemblies, drivers, tools, APIs, etc. Finally, we will show you how to trigger/schedule/orchestrate SSIS package executions as first-class activities in ADFv2 pipelines.